Purina Mills has released a heartwarming Christmas commercial, inviting you to watch what happens when a Christmas wish comes true for a young girl and one very special animal. The short film features a horse named Sam at Callahan’s Farm, a Horse Rescue & Adoption center, that doesn’t get adopted until Christmas Eve. “Well, Sam, maybe next year”, says the farm owner, brushing him and then turning the lights off and going home. 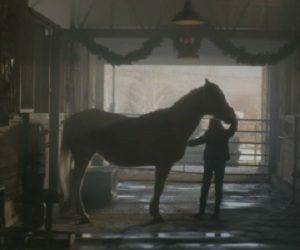 The next morning, on Christmas day, a young girl shows up in front of his stable and Sam feels that she will be his owner. “Hey, Sam”, salutes him the girl, while touching gently his head. The video, with a moving song playing in the background, ends with the girl standing near Sam and keep brushing his head, and with the onscreen line “May every wish come true”.